Like I mentioned in my previous post of Vegetarian dish Longevity, it is a family tradition to eat only vegetarian foods on the first day of Chinese New Year. 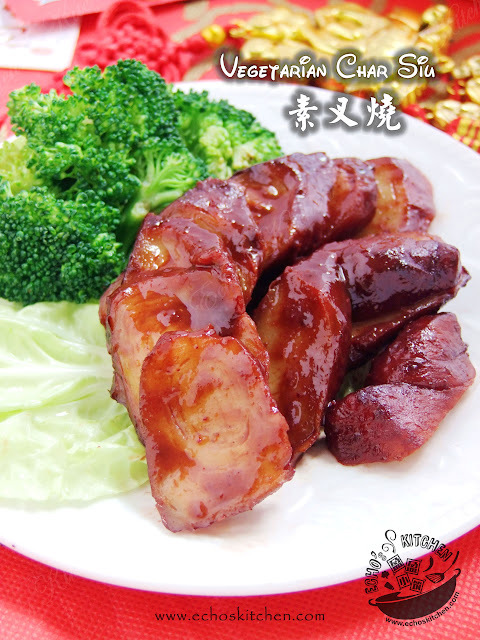 This vegetarian Char Siu is one of the dishes that is well loved in the family. 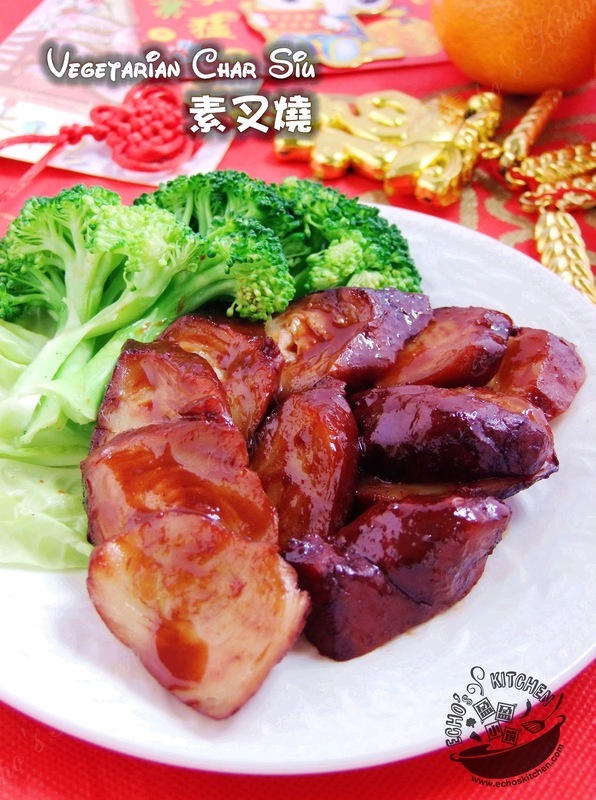 It was rather easy to prepare this dish back home, you can buy ready made Char Siu and fry it. 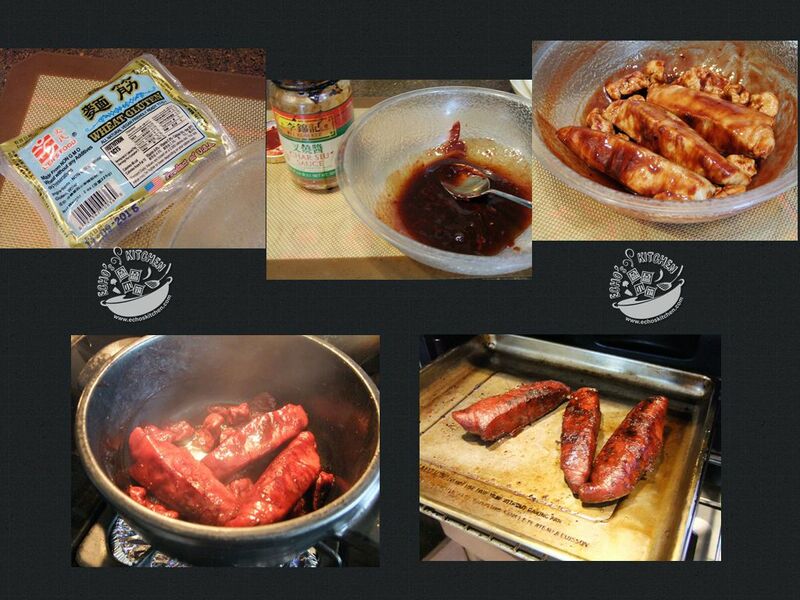 Since I have not seen any ready made char siu here in the Asian supermarket, I decided to make it at home. 1. Place 2 tbsp of Lee Kum Kee bbq sauce , 1 tsp vegetarian hoisin sauce , 1/2 tsp soy sauce / soy sauce and 1/2 tsp sesame oil / sesame oil in a mixing bowl and mix well. Marinate the gluten pieces overnight. 2. Place the marinated gluten and sauce in a cooking put with 1 cup of water, bring to boil and turn down the heat to simmer until sauce thickens . 3. Place the cooked gluten on a baking sheet, spray a thin layer of oil , broil for 5-8 minutes until slightly charred. Note : You can also fry the vegetarian char siu in oil. 4. Slice and drizzle remaining gravy from pot over char siu and serve.